Sometimes when I’m stressed, I find that working on projects helps me feel better. My husband says that he can usually tell my level of stress by the number of projects I’m working on, currently it’s 3. I know, you would think that doing a lot of projects would be more stressful but it actually takes my mind off of whatever is stressing me out. Does that make sense? 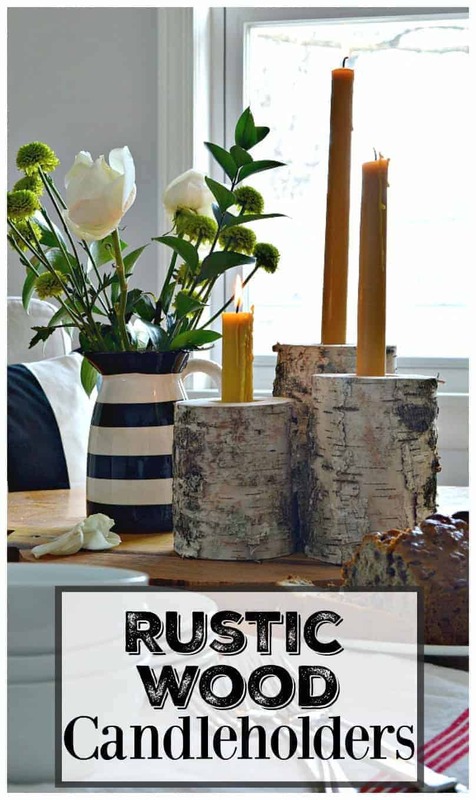 One of the 3 projects I worked on is an easy and inexpensive one, and I love how it turned out…these rustic wood candle holders. 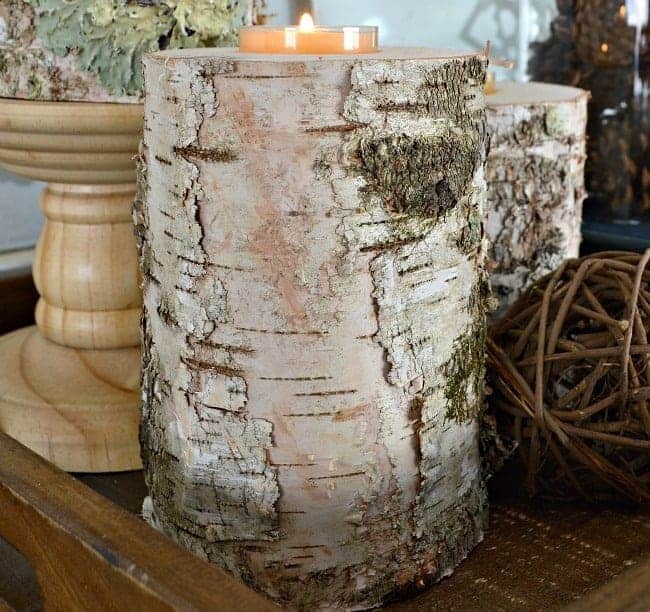 I bought a birch log a while ago so that we could make a few candle holders for our fall decor. Unfortunately we ran out of time after only making a couple, so a few weeks ago we whipped out a few more so I would have a set. 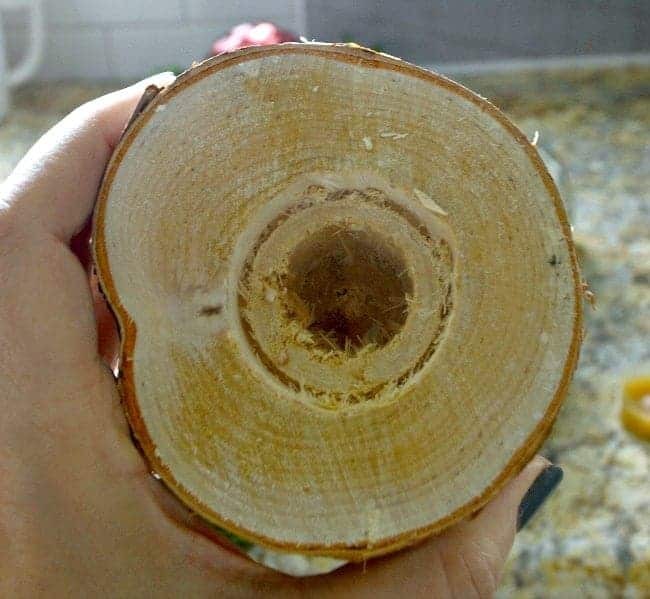 After I cut the birch log into different lengths with the chop saw, we used a hole saw for a tea light and then a butterfly drill bit to make a deeper hole to fit a taper. It only took a few minutes to make the holes and in no time we had a set of dual purpose candle holders. The wood was pretty wet when I cut it so I placed them on the dryer in our basement. After a few days on the warm dryer, they had dried nicely. I love the rustic-ness, the moss and chippy bark. Mother Nature certainly knows what she’s doing. 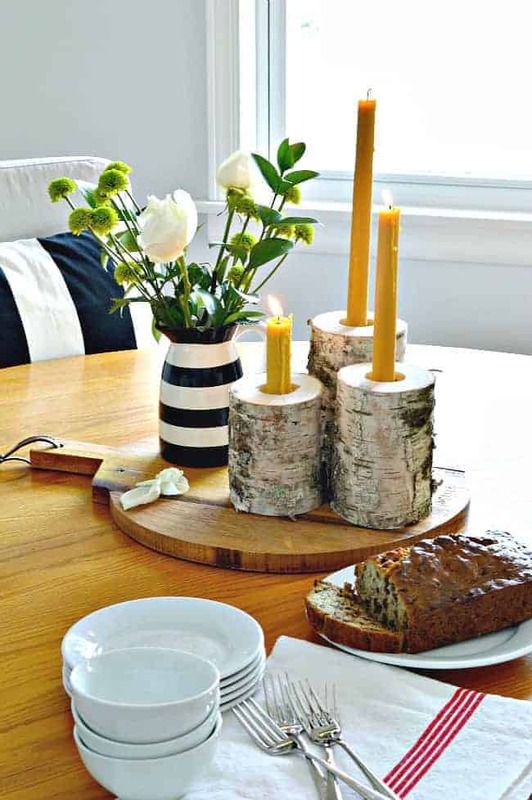 There’s nothing formal about our table settings and the wood candle holders fit right in with our relaxed style. I just added my flower filled striped pitcher, that I got in the Target Dollar Spot, and my yummy chocolate chip banana bread (you can find my easy here), and our dessert table was all set. 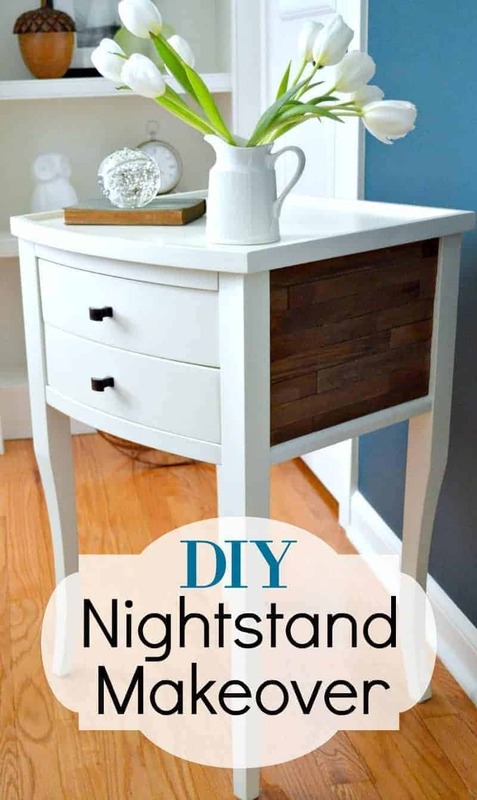 If you’re looking for more easy DIY’s, check out these projects. I’d just be concerned that if the taper burned down too far, it might catch the wood on fire. Thanks for your concern Lauri but I don’t ever leave my candles unsupervised and I would never let it burn down so low that it is too close to the wood. So glad M and bf are doing well Krisit! You are indeed all blessed! The car issue will resolve itself in due time. That DIY is fabulous, I have actual ones from PB but not as great as the ones you did! WOW! 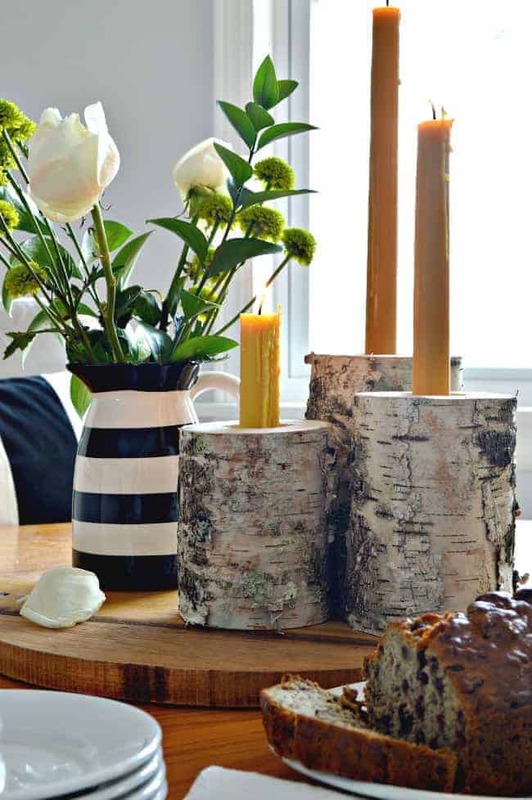 Your birch candleholders look terrific! My hubby made a bunch for me but we never thought to make one end to use for taper candles. He did make one end to fit votives and the other for tealights so that helps. 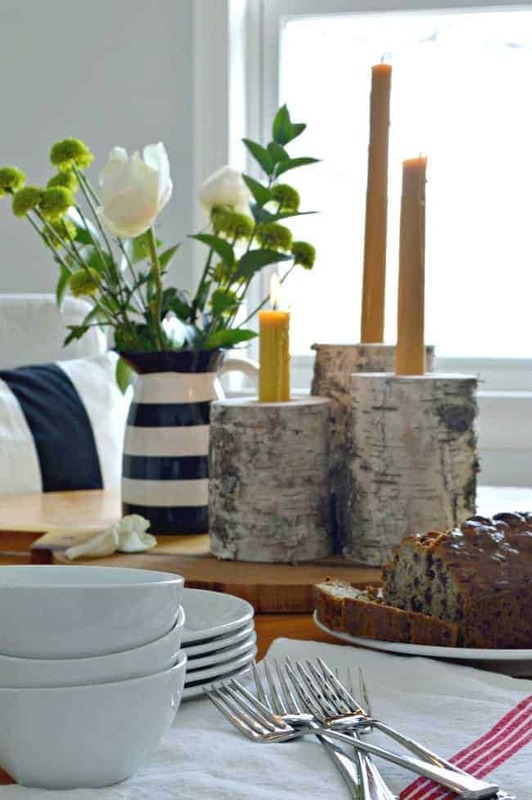 Would love to sit down at your table to enjoy the birch candleholders and a piece of that loaf! 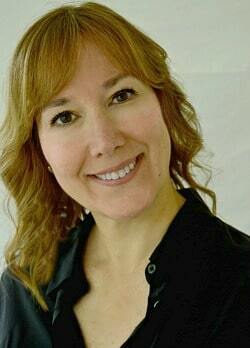 Come on over Lori, we’ll have tea and some of my yummy banana bread by birch candlelight. 😉 Thanks so much for stopping in. What a great project, I’m going to have look through our wood pile for possible candlesticks. Your’s look so beautiful in your home. Wonderful post and I love your blog! Kristi, over time I have made many of these, to make them last longer I put clear gloss polyurethane on them. You can also drill smaller holes and put in imitation flowers. They sell well at craft shows. Keep up the good work it looks great. Thanks so much for the poly tip and the flower idea! I’ll have to try both. Anything with Birch melts my heart. You did a beautiful job. Happily pinned! 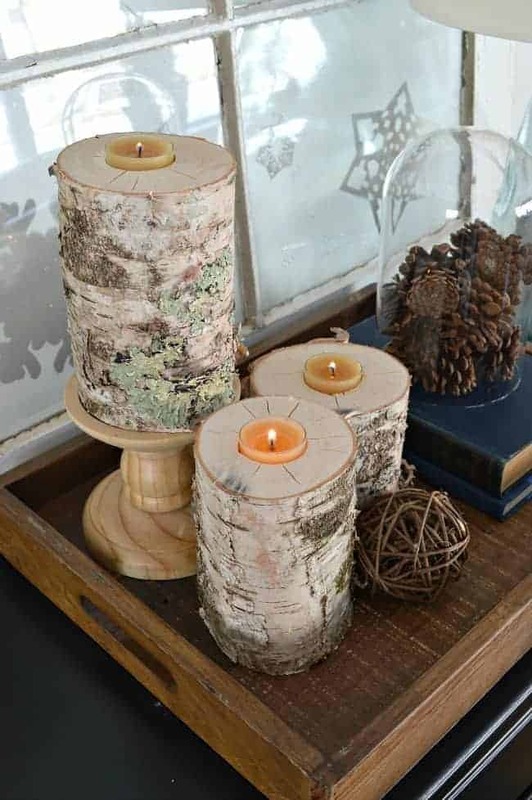 I have always loved Birch trees and those tea lights look awesome in those gorgeous holders! 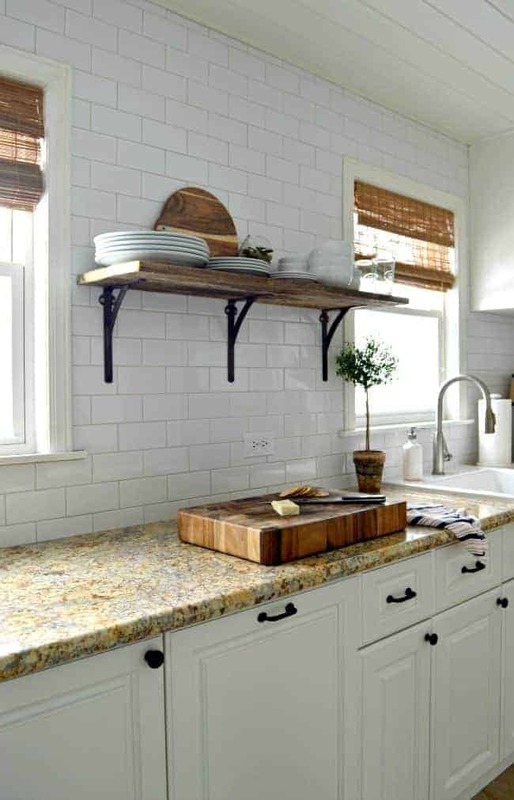 Rustic and classy! Love, love, love! So glad you liked them Jessica! Thanks so much for stopping in. I’m all about options and these are great! Wow and what a bargain for the log…$6? You are the DIY queen!! Glad that your daughter, her boyfriend and pups are all ok. Phew! I just wish that all of my projects were so thrifty, you can’t beat $6. 😉 Thanks so much for stopping in to visit. What a great idea. I liked the tapers better, but it’s nice to ahve a choice. Thanks so much! It’s always nice to have choices. 😉 Have a great weekend! I was thinking maybe make a different size hole in each end of the log…then both sizes of candles would have a custom fit. Actually Julie, both sizes of the candles do have a custom fit. Neither hole interferes with the other but you definitely could do one on each end. Thanks so much for stopping in. Have a great weekend. Times like these I wish we had power tools! Absolutely love that you made these so that they can fit both kinds of candles! I would have never through of that- either settled for one, or tried to make some one way, and some the other (which, really, is silly, ha!). Also glad to hear that everyone is doing well. Hope that your daughter can get the vehicle situation worked out soon! You should start a power tool collection. 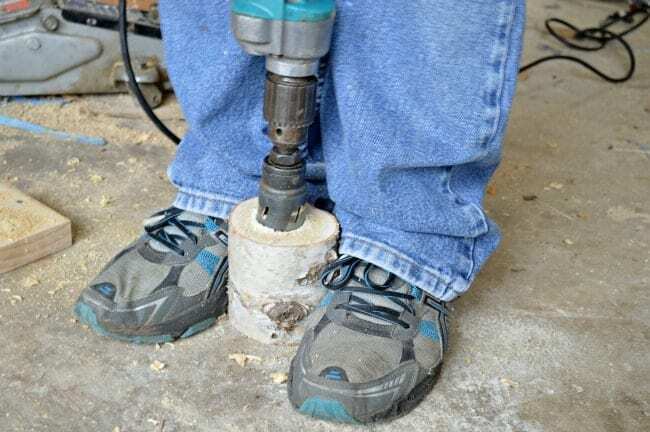 😉 You are artistic and could make some awesome things with a few basic tools. The car situation is a bummer, I knew it would be, but it will get worked out. It always does. 😉 Happy weekend! Thanks Nancy, you are always so sweet to me! 🙂 I looked at them too and when I saw these logs for $6 in my local nursery, I knew I could get several holders and make them exactly the way I wanted. Hope you have a great weekend! Thanks so much Phyllis, I appreciate it. Hope you have a great weekend!